Senator John McCain has long portrayed himself as a politician closer and more committed to the state of Israel than most other politicians who claim to support Israel. He recently told the Jewish Journal that, if elected president, he would become personally involved in the peace process immediately. "And as I said I don’t know how many trips I’ve made to Israel. I know all of the leadership well. I know the parameters that they’re operating under, and I feel fully qualified to hit the ground running." That is why it was astounding that McCain yesterday proposed eliminating a wide range of legislative directives contained in the annual appropriation bills including all assistance for Israel. McCain’s Director of Economic Policy, Douglas Holtz-Eakin, explained to reporters on a conference call following McCain’s speech at Carnegie Mellon University yesterday that the senator was able to produce $60 billion a year in annual savings from elimination of "earmarks" by using the Congressional Research Service’s definition of the term. CRS counts all funding for Israel as well as nearly three-quarters of the entire Foreign Operations Appropriations bill as an earmark. McCain proposed to use the $60 billion savings to offset a series of proposed tax cuts. The funding for Israel wouldn’t be the only casualty of the McCain proposal. It would also eliminate more than $1.8 billion in annual funding for Egypt, nearly half a billion dollars for Jordan, and tens of millions from countries such as Haiti, Kosovo, and the Philippines. The extraordinary savings claimed by McCain for the elimination of all earmarks is the direct result of using the CRS definition, which is far broader than that of other organizations that have analyzed the practice of congressional earmarking. CRS, for instance, identified $14.4 billion in earmarks in the foreign operations bill, while Taxpayers for Common Sense identified less than $200 million in a more recent assessment of earmarking in that bill, and the White House Office of Management and Budget identified only $23 million. There were significant discrepancies between the McCain-adopted CRS definition in other areas of spending, as well. CRS counts $6.6 billion, or nearly two-thirds of the Military Construction bill as earmarks, while Taxpayers for Common Sense and OMB count only $1.2 billion. As a result of the definition used by McCain, virtually all efforts to improve the often deplorable condition of U.S. military family housing around the world would cut off, as would the construction of day care centers for the children of military personnel, dental clinics, and hospitals. Another victim of the McCain "earmark" cuts would be the already lagging efforts to replace aging and often unsafe courthouses. Despite the fact that funding for the courthouses is authorized and contained in the president’s budget requests, they are counted by CRS as earmarks and would be eliminated under the McCain proposal. Even though McCain has included the elimination of programs such as aid to Israel and military family housing that are strongly supported by the vast majority of members of both parties in Congress, his numbers don’t seem to add up to offset the tax cuts he is proposing. First of all, McCain’s estimates are based on CRS’ analysis of the Fiscal Year 2005 Appropriation bills. There is a general consensus that 2005 was the year in which earmarking in appropriation bills reached its zenith. According to Taxpayers for Common Sense, earmarks in the most recent year, Fiscal Year 2008, were 23 percent below 2005 levels. As a result, a significant portion of the savings that McCain is offering to make in order to offset his tax cuts has already been carved out of the budget and is no longer available as an offset. Secondly, the CRS analysis of Fiscal 2005 earmarks does not in fact add up to $60 billion. CRS totals for the 13 appropriation bills add to $52 billion. 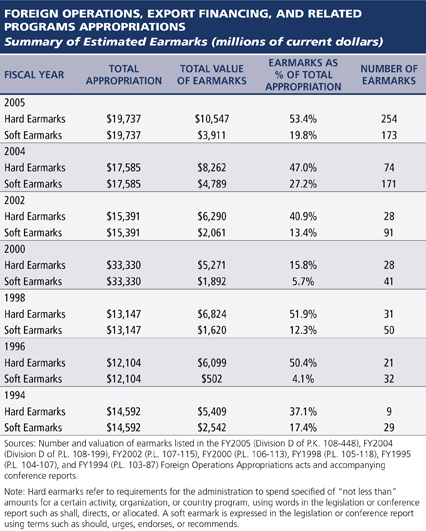 Finally, Holtz-Eakin argues that the amount of spending in the budget driven by earmarks is not only greater than the amount identified by TCS and OMB, but also much greater than the amount identified by CRS. Through logic that seems to escape all of the professional budget analysts I have been able to reach, he says that spending that was included for earmarks in previous year budgets somehow results in spending for earmarks in current year budgets even if those earmarks are not in the budget. He estimates that that produces another $30 billion in savings. He fails, however, to explain what cuts would be required to make those savings. Putting forth even deeper tax cuts while maintaining an indefinite troop presence in Iraq poses a serious challenge to any modicum of fiscal discipline. Sen. McCain owes it to the country to demonstrate in detail that his offsets are real, achievable, and add up in the real world to the totals necessary to prevent tax plans from producing even more red ink. The conference agreement appropriates $4,783,500,000 for the Foreign Military Financing Program. The managers have included language providing $2,220,000,000 for Israel and $1,300,000,000 for Egypt as proposed in both the House and Senate bills. The conference agreement includes language similar to that proposed in the Senate amendment. The conference agreement provides $360,000,000 for Israel and language requiring disbursement of funds within 30 days of enactment of this Act. The conference agreement provides not less than $535,000,000 for Egypt as proposed by both the House and Senate.